How to Easily Master Format SAMSUNG GALAXY STAR PRO S7260 & STAR PRO DUOS S7262 with Safety Hard Reset? Tips and tricks for solving problem SAMSUNG GALAXY STAR PRO S7260 & STAR PRO DUOS S7262 with easy step. There are two kind of the new SAMSUNG GALAXY STAR PRO S7260 & STAR PRO DUOS S7262 with operating system Jelly Bean version, one type is single sim card SAMSUNG GALAXY STAR PRO S7260 and the other one is double simcard SAMSUNG GALAXY STAR PRO DUOS. There are almost no differences between SAMSUNG GALAXY STAR PRO GT-S7260 vs SAMSUNG STAR PRO DUOS GT-S7262. Both of them using the same 1Ghz processor speed with 512 MB RAM, much more improvement from the previous Samsung Galaxy Pro, the LCD screen size use 4 inches width. How to Fix and Problem Solving for Recovery SAMSUNG GALAXY STAR PRO S7260 & STAR PRO DUOS S7262 hang or not responding or malfunctions or stuck or freezing or bricked ? Because the specifications of SAMSUNG GALAXY STAR PRO S7260 & STAR PRO DUOS S7262 is not too high, sometime if we installed some applications from Google Play Store or installed manually with apk files, can make the phone become problem such as hang or stuck or bricks or frozen or LCD touch screen not responding. If this problem happen, first we can try to do soft reset or restart or reboot SAMSUNG GALAXY STAR PRO S7260 & STAR PRO DUOS S7262 to remove the temporary files or cache which sometime make the phone act not normal. If the phone still get problem, better we try to do hard reset or master format. How to Soft Reset or Reboot or Restart SAMSUNG GALAXY STAR PRO S7260 & STAR PRO DUOS S7262 ? Doing soft reset or reboot is easy and can be do anytime we like because it will not removed our important data. The easy way to soft reset or reboot or restart SAMSUNG GALAXY STAR PRO S7260 & STAR PRO DUOS S7262 by remove the battery and then put again to the place then turn on the SAMSUNG GALAXY STAR PRO S7260 & STAR PRO DUOS S7262. If you do not want to open the battery, you can do easily with pressing Power Button for several seconds and the option menu to turn off or reboot will appear. SAMSUNG GALAXY STAR PRO S7260 & STAR PRO DUOS S7262 will do the process to Master Reset to Factory Default, wait for several minutes. The SAMSUNG GALAXY STAR PRO S7260 & STAR PRO DUOS S7262 will doing the process of restoring to factory default. How to Restore and Reinstall Clean Android Operating system / firmware at SAMSUNG GALAXY STAR PRO S7260 & STAR PRO DUOS S7262 ? If the phone get problem and we need to reinstall or restore the factory default Android operating system can be easily do because the source file of clean and factory default Android already saved inside the SAMSUNG GALAXY STAR PRO S7260 & STAR PRO DUOS S7262 rom. If nothing we can do to fix our smartphone problem, that is recommended to do reinstall or restore the default operating system or firmware, but please remember to backup any important data before doing reinstall, because all important data or installed applications will be removed or wipe. To do reinstall or restore the clean Android operating system can be do with performing hard reset step above, then the operating system source will be reinstall by itself. How to Unlock or Fix or Bypass or Solutions for SAMSUNG GALAXY STAR PRO S7260 & STAR PRO DUOS S7262 forgot password code or security lock screen pattern or pin? There are many choice to give security protection at SAMSUNG GALAXY STAR PRO S7260 & STAR PRO DUOS S7262, the most use is password pin or screen lock pattern security protection. What happen if we forgot about security protection password or pattern? We still can bypass or unlock the forgot password or security protection by pressing Forget Password / Pattern button, the button sometime will hide before we do several time wrong password answer continuously until the phone unlocked. Press Forget Password / Pattern button will allow us bypass the security password or pattern by answer the Google account username and password. If we can not access Google account username name and password then nothing we can do except doing hard reset or master format. What is PIN BACKUP at SAMSUNG GALAXY STAR PRO S7260 & STAR PRO DUOS S7262 ? This is safety procedure to help up unlock forgotten security protection at our phone. When we give the security protection at our SAMSUNG GALAXY STAR PRO S7260 & STAR PRO DUOS S7262, it also give step to put our own PIN as BACKUP PIN. This backup PIN use to bypass or unlock forgotten security code later. Use above steps to unlock forgot password or screen lock pattern security protection using Google account or Gmail username and password. How to Improve Performance SAMSUNG GALAXY STAR PRO S7260 & STAR PRO DUOS S7262 to make run more faster? If we have SAMSUNG GALAXY STAR PRO S7260 & STAR PRO DUOS S7262 and run only default applications to chat or email or browsing or sms or phone or social media or some easy game like Angry Bird, then the phone will run without problem, but sometime the SAMSUNG GALAXY STAR PRO S7260 & STAR PRO DUOS S7262 run more slowly after use several times. Usually after check several problem happen because to many applications installed or wrong setting also can make the phone become slowly. To make SAMSUNG GALAXY STAR PRO S7260 & STAR PRO DUOS S7262 back to faster again, please try to remove or uninstall not use applications. If we need to make the performance back like new again, we can consider to do hard reset or master format. Is That Any Secret Code for Doing Format SAMSUNG GALAXY STAR PRO S7260 & STAR PRO DUOS S7262 ? The secret code for doing hard reset SAMSUNG GALAXY STAR PRO S7260 & STAR PRO DUOS S7262 is *2767*3855#. But please remember to always becareful typing that code, because the SAMSUNG GALAXY STAR PRO S7260 & STAR PRO DUOS S7262 will doing hard reset and remove all data and installed applications. How to make Longer Life for SAMSUNG GALAXY STAR PRO S7260 & STAR PRO DUOS S7262 Battery ? At everage usage, the SAMSUNG GALAXY STAR PRO S7260 & STAR PRO DUOS S7262 can be use normally one day if we not use the internet connection. Because SAMSUNG GALAXY STAR PRO S7260 & STAR PRO DUOS S7262 do not have 3G connection, we still can use 2G internet data connection to connect always on Internet without too worry about the battery, but if activate the 2G data will make the battery less strong than without Internet data connection. But usually if comparing with other phone using 3G, then 2G is more battery friendly. The brightness also important to make not max bright, because it will consume more power. The other option that you need to do is turn off all not use connection such as Bluetooth or Wifi. If the are many background process applications also will eat too much battery capacity, so better to reduce the installed applications. That options are important to improve SAMSUNG GALAXY STAR PRO S7260 & STAR PRO DUOS S7262 battery live performance. How to Make SAMSUNG GALAXY STAR PRO S7260 & STAR PRO DUOS S7262 Faster for Browsing or Doing Internet Connection ? As we know maybe using 2G internet data connection is not as fast as using 3G, but some user does not need to use 3G because they do not use the smartphone for doing hard work with Internet, we still can use all Internet stuff using 2G but with the slower speed. How to make SAMSUNG GALAXY STAR PRO S7260 & STAR PRO DUOS S7262 faster for Internet speed? When we need faster Internet, we still can use Wifi data connection at SAMSUNG GALAXY STAR PRO PRO S7260 & STAR PRO DUOS S7262 for doing more faster Internet connection. How to Activate GSM 3G HSDPA at SAMSUNG GALAXY STAR PRO S7260 & STAR PRO DUOS S7262 ? There are some user keep asking about the availability of 3G or HSDPA GSM at SAMSUNG GALAXY STAR PRO S7260 & STAR PRO DUOS S7262. What is the network connection use 3G or 2G for SAMSUNG GALAXY STAR PRO S7260 & STAR PRO DUOS S7262?. The answer is this phone does not have 3G or HSDPA for Internet data network. This phone have Internet access with GSM network but only run at 2G. Using 2G GSM network for SAMSUNG GALAXY STAR PRO S7260 & STAR PRO DUOS S7262 still can work for normal use like email, chatting or other Internet activity, but of course at slower speed if compare by 3G. How to Upgrade SAMSUNG GALAXY STAR PRO S7260 & STAR PRO DUOS S7262 Android Operating System ? Can we update SAMSUNG GALAXY STAR PRO S7260 & STAR PRO DUOS S7262 with Kitkat or newer version. As we know that this phone already use Android Jelly Bean of factory default operating system. But Samsung does not have official update Kitkat for this phone. There are maybe some other community give steps to update SAMSUNG GALAXY STAR PRO S7260 & STAR PRO DUOS S7262 operating system use Kitkat version, but please note that you need to root and install some unofficial ROM with some expert steps. If you are not sure about that, please do not update unofficial ROM because some wrong steps can make our SAMSUNG GALAXY STAR PRO S7260 & STAR PRO DUOS S7262 become corrupt and can not use anymore. Some unofficial custom ROM also usually not work as what we expect. There are certain functions that maybe not work normally and we need to wait for the latest custom ROM updates from the creator or community. Besides that, the difference between Jelly Bean and Kitkat is not very significant. [A] Hi, maybe you have installed bad apps or your Samsung Galaxy Star Pro has been infected by viruses or malware. We suggest to do hard reset using menu Setting or hardware button combination key like steps at #option 2 above. It will reformat your Samsung Galaxy Star Pro operating system to factory default. [Q] I have Samsung gt-s7262. I forgot back up pin but when I try the combination of volume up +Home key +Power key simultaneously, the reset menu doesn't pop up, neither does it vibrate. please am stressed. [A] Hi, you have to try turn off first before doing hard reset using hardware button combination key. Please also make sure all hardware button at your Samsung Galaxy Star Pro is working properly, otherwise, it will not work with hardware button reformat. The information from this page describe about samsung s7262 hard reset,s7262 hard reset,samsung 7262 hard reset,samsung gt s7262 hard reset,how to hard reset samsung s7262,how to reset samsung galaxy star pro,star pro hard reset,samsung gt-s7262 hard reset,how to reboot samsung galaxy star pro,Hard reset samsung s7262. If you need another resource for hard reset, use search function at this homepage or find from our related posts. How to Easily Master Format HUAWEI P20 (PRO) with Safety Hard Reset? Hi, please try to do factory reset or reformat using hardware button combination key, it will not ask for any pin or password. Please do it carefully. sir my galaxy star s5282 doesn’t installing any apps,there no apps installed except pre intalled apps. Hi, please make sure you still have free internal space before install applications from Google Play Store, sometime we have saved our musics or movies files inside internal memory, then it will make the empty space become full. If you are sure you never downloaded or saved any files, then please try to do hard reset or master format, after that login or signed in with Google account, then install any applications from Google Play Store. Hi, please try to hard reset your Samsung Galaxy Star Pro using hardware button like steps at #Options 2 above, press Power Button + Volume Up Button + Home Button. Please note this steps may not work for some non standard tweak or if your phone has hardware bricks. You may need to consult with Samsung authorize service center. hi . i am anshul and i am using samsung galaxy star pro gt s-7262 and it is not starting up and it is rebooting after the samsung logo comes!!!!!!!!! !plz help and if you can send me the via link of software link for my phone then it will be really help full!!!!!!! Hi, please follow steps at #Option 2 above for doing hard reset using combination hardware button. But this steps can not always work if your Samsung already get non standard tweak like root or using custom rom or get hardware trouble. If your problem still happen, then you have to bring to Samsung authorize service centers. Hi, maybe you right, especially for Samsung which already tweak or use custom rom. However, this code is standard Samsung Android phone format hard reset code which available for standard factory default rom. Hi, my samsung GT S7262, is not detecting the sim card. I am using microsim. Can u give me a solution for this. Hi, first you have to try change your simcard to different GSM simcard for test your Samsung Galaxy Star Pro. If your phone still not recognize different simcard, you have to do hard reset to make sure that your hardware does not get any trouble. do u have any suggestions to improve my phone’s performance? Hi, yes maybe you are right that some applications will run lagging because the specifications of Samsung Galaxy Star Pro is very limited and only advice-able to run daily applications like chatting, email, browsing or some basic entertainment. Maybe you can install some games but with lagging problems in some state because of limited resource. As far as we know this phone still can work normally for Angry Bird and sometime similar like that. Whenever i restart my star duos, the date and time goes to default.. that is 1st january 2013.. and time 1 am.. and then i have to set it manually.. it does not even take automatic network time at times.. what do i do ?? Hi, if you are using GSM data network, then usually your Samsung Galaxy Pro will automatically update datetime to server time. But in somecase, the operator does not have that facility. Please make sure your phone setting already setup to update automatically network time at setting menu. Although your phone does not automatic change to network time and need to setup manually, usually your phone datetime will not be reset as far as your phone battery is not remove for long time or your phone still have power battery. Hi, my s7262 restart again nd again…give me solution..?? 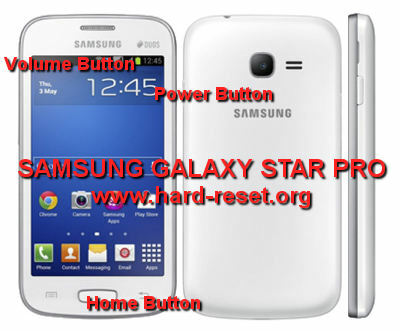 Hi, please try to do hard reset your Samsung Galaxy Star Pro using hardware button combination key above. My samsung star duos S7262, has lost its sim signal. I can’t even send a message though my sim card was already inserted. I tried to consult the samsung service center for the repair, but they said that the fee was 4,800 and I bought this for about 4,990. So i decided not to pursue it. I’ll just buy another if that’s the case. They reformat my phone but still the signal still can’t be found. How should I deal with it? Please help me. Hi, it seems that your hardware get trouble. Usually Samsung authorize service center has already tested about your trouble. Sometime this problems can came from hardware signal module, but for fix this problems, they mostly recommended us to change main board of Samsung Galaxy Star Pro, and this will cost a lot. Therefore, you can try to ask some recommended 3th service center, maybe they can give you other solutions. Hi, when restart or reboot My Samsung Galaxy star phone Date and time is getting Reset to the default date and time. Kindly help. Hi, we can force Samsung Galaxy Star to update datetime referrer with operator time, as far as our GSM simcard already inserted and working well. Make sure the setting is right by go to menu Setting > Data & time > activate Automatic date & time options. The writing the screen is, too many pattern attempts if you forget your google sign in details. You can enter your backup PIN to unlock. Hi, you have already do right process to bypass or unlock forgotten security protections at Samsung Galaxy Star Pro. Please press Forgot Pattern button and continue to type your Google account username and password. Please make sure your internet connection active while authentication at Google server. You also can bypass using backup pin, but if you can not bypass or unlock with Google account or backup pin, then you have to do hard reset using hardware button combination key. Hi, this problems usually happen because the messaging apps are crash with others. You should try to uninstall latest installed applications at your Samsung Galaxy Star Pro. If this problems still happen, try to do hard reset or reformat using steps above. Hi, please try again carefully to reformat or hard reset your Samsung Galaxy Star Pro, first try to use menu setting if your phone still can boot. Otherwise, you need to do hard reset using hardware button combination key, but please make sure your battery is fully charge. Hi, base at your story, you have finish doing software update at your Samsung Galaxy Star Pro, but you get some problems at several touch. Please try to do hard reset, if you still can go to software menu, then do reformat to factory default. However, if you phone always freeze and can not run normally to go to menu Setting, then please try to do hard reset using hardware button combination key. my samsung star pro douse it is not open , and it network tower don’t show it. now it totally closed, it not open. Hi, please try to use different GSM simcard slot. If your phone still not get any signal, then please do hard reset or master format to make sure all setting back to factory default. Hi, please try to change simcard. Other alternative, try to setup you APN setting correctly at your Samsung Galaxy Star Pro base by your GSM provider information. The last options that you can try is doing hard reset or master format, by this steps will remove all important files at your Samsung Galaxy Star Pro, therefore you have to backup all important data first before doing master format. Hi, at this conditions you should do hard reset with hardware button combination key, please follow steps at #Options 2 above. my phone is automatically restarting..
Hi, please follow steps to hard reset your Samsung Galaxy Star Pro using hardware button combination key. i am using galaxy star pro..from since nearly 8 months..i have factory data reset 10 times..when i receiving call calls i should not able to accept the call..so can i download app for accepting calls in a new way..what is that app name? when i attached samsung galaxy star pro duos s7262 with computer through samsung kies, it show some new upgrade which is 499 mb its look too big….it will be download in phone memory or in computer..pls give a step by step guidence…. Hi, the firmware upgrade will be downloaded first at your computer, but after that will be flash to your Samsung Galaxy Star Pro, therefore it will use some amount of space. I use samsung 7262 star pro duos.phone and contact application have been automatically deleted.now I have problem to phoe and see contacts.pls answer me immediately . Hi, by default contact applications can not be removed at your Samsung Galaxy Star Pro unless you do rooted or some tweak options. However you can try to download good 3th party contact applications from Google Play Store. You can find some of them, but please read the user review carefully before download and install that apps at your Samsung Galaxy Star Pro. Hi, Samsung Galaxy Star Pro S7262 is only work at 2G GSM network, therefore you can not use faster 3G/HSDPA broadband network. Hi, please try to do hard reset using hardware button combination key to reinstall factory default operating system of your Samsung Galaxy Star Pro. Please also remove microSD card and before doing hard reset. Hi i have samsung galaxy star plus why when i update software, can finish reboot only 27% and turn on the phone. And say that software update failed. Hi, it seems that you have not finish installed firmware update at Samsung Galaxy Star Pro. First, you can try to do hard reset using hardware button combination key and see whether it can work or not. Otherwise you have to flash again using computer and ODIN, but it is not as easy as OTA firmware update. We suggest to bring your Samsung Galaxy Star Pro to Samsung authorize service center to reflash official firmware. Hi, usually because you have installed several applications and some of that apps run in the background wait data update like chatting or social media or games. The insufficient RAM can make your Samsung Galaxy Star run slowly. Please try to uninstall some not use applications to give more RAM for system. Otherwise, you can consider to do hard reset to make your phone run faster like new again. Hi, please give more information about what kind of browser do you use. Please download other 3th party Internet browser at your Samsung Galaxy Star Pro like Google Chrome or Firefox which is free from Google Play Store. Hi, sadly if you have operating system problems, then maybe the only steps that you should try is doing hard reset with hardware button combination key. This process will erase all important data at your Samsung Galaxy Star Pro. Hi, for this conditions, we suggest you to backup all important data at Samsung Galaxy Star Pro, then please do hard reset to reinstall factory default latest operating system that you have upgraded. Sometime old setting can not work properly at new update firmware. Hi, yes you right, the 512 MB RAM is total by specifications, but actually you will see less that that because at real situations the 1 MB is not 1024 kilobytes, it will have less that that. But anyway this situations will not take any problems with your Samsung Galaxy Star Pro. You still have to safe RAM by run only specific applications in one time. Hi, please try to boot again normally or soft reset by press and hold POWER button until your phone turn off by itself. After that you can try to POWER on again. If everything fine, then your Samsung Galaxy Star Pro will boot normally without safe mode. Otherwise maybe some trouble happen at your operating system and need to reformat or hard reset to factory default. Hi, Samsung Galaxy Star only have limited internal memory capacity, therefore your phone will easily get insufficient storage space. Please note, this is not same with external memory microSD, because many social media applications and chatting use internal memory to keep their data like Facebook or Whatsapp and something like that. Please remove one of them then you will have more storage. I have Samsung gt-s7262. I forgot back up pin but when I try the combination of volume up +Home key +Power key simultaneously, the reset menu doesn’t pop up, neither does it vibrate. please am stressed. Hi, you have to try turn off first before doing hard reset using hardware button combination key. Please also make sure all hardware button at your Samsung Galaxy Star Pro is working properly, otherwise, it will not work with hardware button reformat. Hi, maybe you have installed bad apps or your Samsung Galaxy Star Pro has been infected by viruses or malware. We suggest to do hard reset using menu Setting or hardware button combination key like steps at #option 2 above. It will reformat your Samsung Galaxy Star Pro operating system to factory default.